This deep action Restoration Formula helps increases the skin's elasticity, firmness and smoothness by enhancing the skin's ability to renew and revive from within. 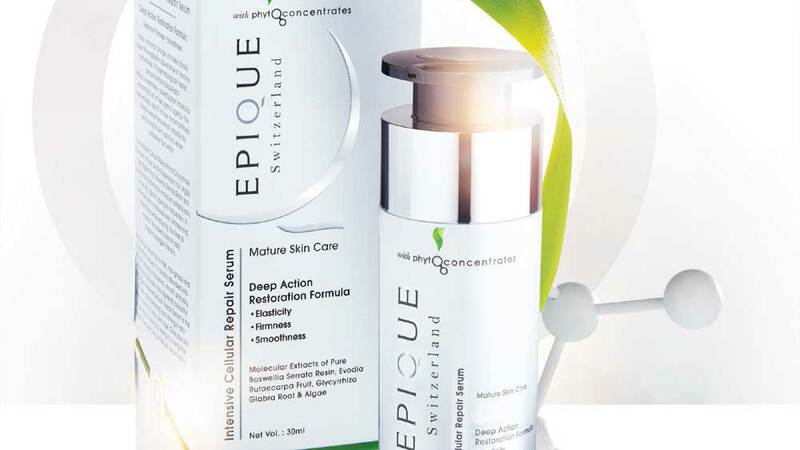 Epique (Switzerland) launches its 'Intensive Cellular Repair Serum' for mature skin care. This deep action Restoration Formula helps increases the skin's elasticity, firmness and smoothness by enhancing the skin's ability to renew and revive from within. Infused with Phyto-Concentrates, this serum has a uniquely fresh, non-greasy and lightweight texture. It is quickly absorbed into the skin, leaving it nourished, smooth and silky, while helping the skin stay agelessly beautiful. This clinically tested formula contains Epique Lab's Phyto-Concentrates – powerful plant molecular extracts that act on key signs of ageing – fine lines, wrinkles, loss of firmness and smoothness. The Intensive Cellular Repair Phyto-Concentrate Complex of Pure Evodia Rutaecarpa Fruit, Algae and Glycyrrhiza Glabra Root molecular extracts acts on the key signs of ageing in mature skin. It enhances the skin's moisture level, firmness and smoothness while reducing fine lines & wrinkles. This powerful serum acts at the intra-cellular level to deeply energise the skin. Priced at Rs 5500, the Epique Intensive Cellular Repair Serum is the first step after cleansing and toning in any beauty routine for every skin type.